Limitations of portable fish finders in the past sadly meant that shore anglers were locked out of the fish finder club. But that’s changed over the past few years as a handful of innovative companies have created a new generation of castable fish finders. This year’s best all-around castable choice for tech-savvy anglers is the Deeper START. 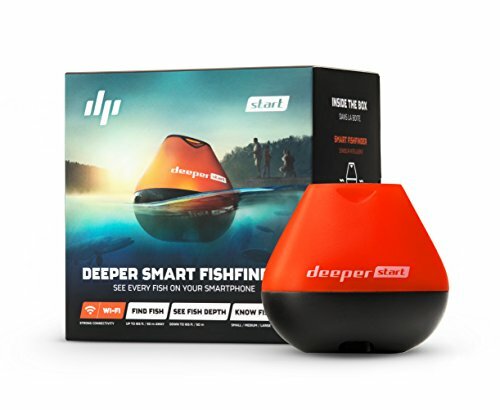 The Deeper START offers an unparalleled combination of reliable WiFi connectivity and amazing smartphone app leveraged by the company’s more advanced fish finders that put it into the lead. 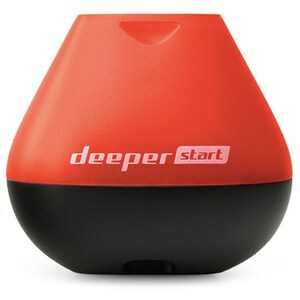 Skip down to read more about the Deeper START. Stepping back a bit in terms of kit but carrying an affordable price tag when considering the company’s accessory packages, ReelSonar’s iBobber has been on the scene for years and carries this year’s best tech value. 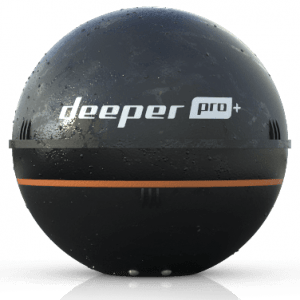 Skip down to read more about the ReelSonar iBobber. This year’s choice for anglers looking for a high-tech choice where cost is no constraint should consider the Deeper Smart Sonar PRO+, which layers on impressive transducer-based GPS and map-making functionality. Anglers seeking a well-balanced mix of reliable, solid state technology from a long-time fish finder manufacturer a should consider Vexilar’s SP100. Skip down to read more about the Vexilar SP100. Anglers seeking technological innovation should consider the Lowrance/FishHunter Directional 3D, an impressive technological package that hints at at an augmented reality future for fish finders. Skip down to read more about the Lowrance/FishHunter Directional 3D. Targeted squarely at shore anglers, the newest generation of castable fish finders have finally allowed the rich understanding of fish location and behavior that these have afforded boating anglers for decades. The promise was always tantalizingly close. While hand-held portable fish finders have been available for some time, many of them with floating transducers, their range was limited by wires to a few dozen feet. Wireless fish finders appeared, ditched the wires in favor of short-range radio signals transmitting to very basic LCD screens. It wasn’t until manufacturers started relying on smartphones and tablets with Bluetooth and WiFi reception capabilities that attractive, castable fishfinder solutions became a reality. Leaning on the high-definition color screens that consumers already own allowed these manufacturers to concentrate their value offering on the floating, castable transducers. This makes for a highly readable fish finders, in relatively affordable packages. Choosing the best castable fish finder depends on a variety of factors. 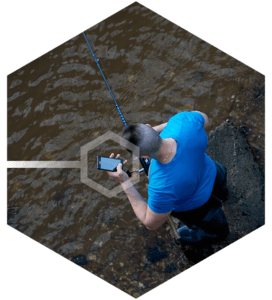 Castable fishfinders’ transducers connect in one of two ways with their paired smartphone or tablet: WiFi and Bluetooth. WiFi models are advertised as being able to connect from up to 300 feet away, while typically Bluetooth models can range up to 130 feet. WiFi models also tend to maintain better connection through obstacles and interference. 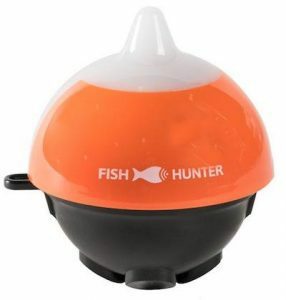 The best castable fish finder feature a reliable connection over a long range. All fish finders can only effectively detect fish, obstacles, and bottom down to a limited depth depending on the frequency of their sonar pulses. Higher frequencies are more accurate in shallow waters and create more detailed images, but can’t penetrated to lower depths. Some fish finders employ two or even three frequencies, giving them multiple overlapping modes of operation. These are often rotated automatically in the so-called CHIRP feature, allowing an ongoing compromise between depth and clarity. When in doubt, choose a model that can reach deeper than what you expect to need. It should be noted that all fish finders stop tracking in water depths less than a foot. But at those depths, you don’t need a fish finder. You need a spear! The bare minimum view based on – you guessed it – a beam firing straight down below the transducer. All the models tested feature this data view that reduces the reduces the underwater environment to a side-scrolling 1980s video game. Nothing revolutionary here, although there were differences in readability at the high and low end. This is an innovation that represents the future for all fish finders: models that create a three-dimensional detailed model of the bed structure and visualize fish and obstructions above it. Various versions of layered 3D information have existed in traditional, boat-mounted fish finders for years, but are new developments for castable fish finders. Bathymetric mapping is the process of compiling GPS readings with depth measurements from a series of passes over an area to create a shaded, 2D map of the 3D bottom. Although this view isn’t populated with detected fish, it does create a tangible map that From a single spot on shore and with a handful of casts, anglers can “paint in” a relatively detailed picture of underwater topography. Any device trying to qualify as the best castable fish finder should have some kind of mapping capability. Generally speaking, the heavier the castable transducer, the farther it can travel with each cast. That said, laden any device with more and more electronics and it’s bound to get heavy. What this does mean is that heavier entrants in the category may require casting with a stiff rod and 10- or 20-pound lines to take advantage of their longer connectivity ranges. Some entrants in the category feature add-on accessories to mount onto small watercraft. Of course, any of them can be towed behind a boat using the casting attachment points, but the ability to set and forget the transducer unit does have some benefit. For buyers trying to find the best castable fish finder or comparing a device against a more traditional portable or boat-mounted unit, this versatility is important. It goes without saying that all of these fish finders require an iOS or Android device, be it a tablet or a smartphone, running each manufacturer’s free app to do the work of a traditional fish finder screen. Each app has its own strengths and weaknesses, and fortunately all the apps tested can be installed for free. They all also have demo modes, enabling prospective users to test the interfaces for themselves. It should be noted that none of the apps require a cellular signal to work. Here we’ve laid out in-depth info on our choices for the five best castable fish finders available this year. The START represents a change for Deeper from last year’s 3.0, now going after the lower price point entrants from Vexilar and ReelSonar. The unit offers a 120 kHz beam with a 40 degree cone, representing the happy medium between the dual beams offered by the discontinued 3.0 model. The Deeper START uses WiFi to connect the sonar unit to the handset. This is a change from the 3,0, which used Bluetooth for its connection. This change means that ReelSonar’s iBobber is the only category entrant for 2019 that still relies on Bluetooth for a connection. Given the iffy (at best) connection Bluetooth provides through water, we wouldn’t be surprised if this is the last year for any Bluetooth-based castable fish finders to make it to our review set. Where the START really excels – an pulls away from the other entry-level entrants – is in its app, which is shared across the Deeper line. The user interface is detailed, well designed, and intuitive. While some others in the category can prove to be rough on the eyes after prolonged viewing, the 3.0’s UI is a delight over the long term. It really feels like a core component of the product, rather than an afterthought. In all, the Deeper START is a solid point of entry for price-conscious anglers to get into Deeper’s line of slick fish finder tech. 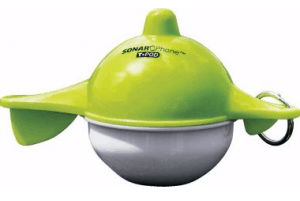 ReelSonar’s iBobber took an existing concept – the bobber in a float fishing setup – and up-teched it to include a sonar transducer. As you’d expect, the iBobber is by far the lightest in the category, meaning a cast will cause only a small splash that’s less likely than some others to spook fish. And that cast will be a short one, as the transducer’s Bluetooth connectivity limits its range to 100 feet. This is probably far enough for the infrequent angler, but avid anglers may find this limiting. Unfortunately, the iBobber’s app is a step down from others in the category. 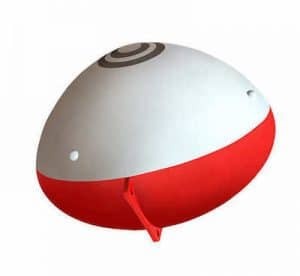 It features two modes – a mapping mode that records a one-off 2D side view of the bottom contours, and a fish finding mode to employ once an angler has the lay of the land. Some reviewers found accessing the contour map difficult, and the animation and detail of the fish finder mode were both unimpressive. The transducer also uses a proprietary charging cradle that’s frankly too big to misplace, so better than the alternative. Battery life is solid, owing largely to Bluetooth connectivity given the iBobber’s small package. The iBobber does have some features unique to the category. 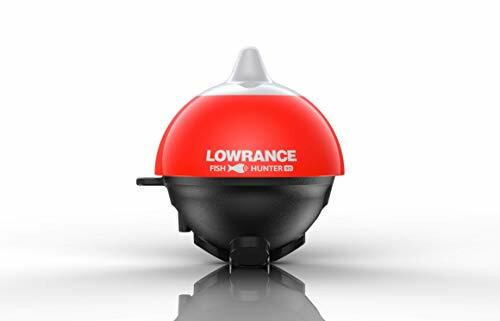 It includes a electronic fish attractor that mimics the vibrations of prey, luring in predator fish and priming them to strike. It also features a strike alarm. Unfortunately both features can’t be used simultaneously. 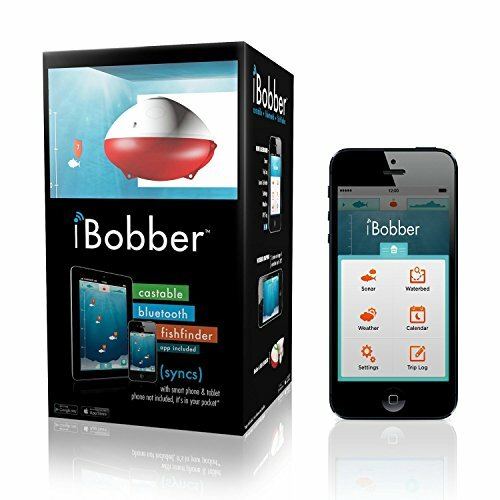 The iBobber is the only entrant with dedicated smartwatch apps, which may be a preferable device to use once the contours have been mapped and the unit is set to fish alarm mode. Overall, the iBobber is a lightweight, affordable solution for low-key anglers, that has the side benefit of consolidating a few pieces of fishing tech in a single package. 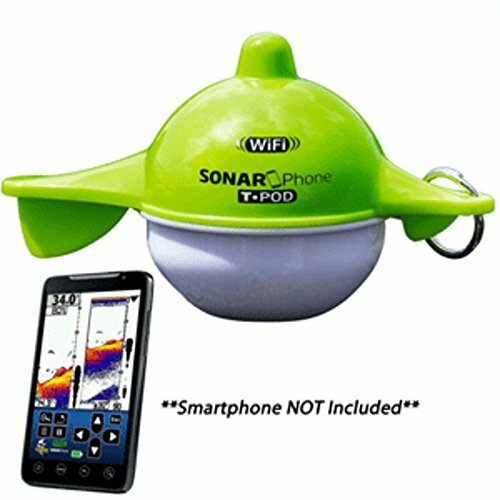 The Deeper Smart Sonar PRO+ takes many of the basic aspects of the Smart Fishfinder 3.0 offering – elegant form-factor, robust hardware, and an excellent smartphone app – and layers on WiFi, an upgraded sonar transducer, and onboard GPS. The inclusion of WiFi means that the PRO+ has a category-leading range of 330 feet, 30 feet more than the next closest competitor in the Vexilar. The upgraded transducer and can ping down to 260 feet, 100 feet deeper than the next closest competitor in the category. But it’s the onboard GPS that the PRO+ uses to springboard ahead of the competition. Like FishHunter’s offering, the PRO+ features a bathymetric mapping function to capture and save contour maps of the bottom. The mapping is aesthetically pleasing, matching the rest of Deeper’s interface. But it’s what Deeper offers with the data that really sets it apart. The company has introduced an online platform, Lakebook, where users log in to to privately store and organize bathymetric maps they’ve captured in the past. This pulls the maps out of the phone environment and into the cloud, where they can be viewed, printed, and downloaded for sharing with other apps. It’s a feature that’s historically been reserved for high end installed fishfinders, and one that allows anglers to go a step beyond to really building an understanding of the environment they’re fishing. Some reviewers lament that Deeper hasn’t created the ability to share maps between Lakebook users, but it’s an exciting development for the castable fish finder space. 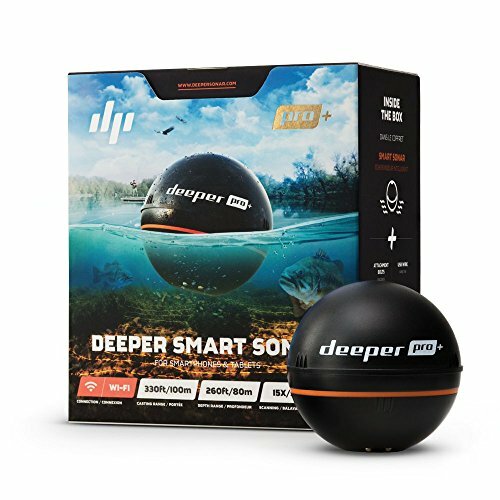 Overall, the Deeper Smart Sonar PRO+ is a formidable offering, combining category-dominating sensing and transmission technology with an exciting online data platform. Vexilar’s SonarPhone 100, or SP100, represents the entry-level vying for the best castable fish finder title, and is as basic as expected for the price-point. The transducer, which Vexilar has named the T-Pod, had a unique form factor (think: tiny green submarine) that features the best daylight visibility in the group. The body and fishing line connection point are robust for the category. The SP100 uses WiFi, a surprise at the price point. The app features a 2D sonar data view and is very similar to most fish finder displays. Readability is fine – not something that can be said for all entrants in the category. Some users report the unit not living up to its four-hour advertised battery life. Like most of the units in the category, the T-Pod only goes live when its contacts are touching the water. Depending on how an angler uses the fish finder – constant trolling versus just the occasional casting – four hours may not be enough.The T-Pod uses a proprietary charger with two leads – one to charge and one to initiate a factory software reset – that plugs into USB. Vexilar does throw in a neoprene armband large enough to hold a typical smartphone running its app. No other entrant in the category included a mounting solution of any kind for the paired device. In all, the Vexilar SP100 is a solid entry-level choice for the category. The FishHunter Directional 3D Wireless fishfinder represents a glimpse of the future direction for portable fish finders. Although not rated by retail buyers as highly as the others in the category, the FishHunter really packs in some aspirational tech. The transducer float incorporates five directional transducers – port, starboard, ahead, astern and down – into a single package, hence the name. Together they’re used to cobble together two data views that are unique for the category. The Directional was also the first entrant we looked at to feature GPS onboard the transducer. This enables bathymetric mapping, a feature shared by the Deeper PRO+. All this tech, along with batteries to accommodate 10 hours of continuous use, comes at a significant size and weight penalty. The Directional is roughly the size of a baseball and weighs in at a hefty 6.3 ounces. Casting it to the max range of 200 feet seems like it could spook fish. Also, given the unit’s weight, some buyers have voiced concerns about the strength of the molded tow-point where the transducer is tied off. Overall, the FishHunter Directional 3D Wireless is an impressive, if somewhat husky, collection of fishing technology that points the way toward a compelling future. The castable fish finder category has taken some real leaps forward over the past few years, and the offerings we reviewed are strong across the board. It’s an exciting category with a bright future as smartphones and tablets become ubiquitous devices. But we’re here to determine the best castable fish finder.